I am a third-generation Oregonian, born and raised in the Willamette Valley, and currently making my home in SE Portland. I make my living with work in Public Health, a career that is fulfilling as much as it is challenging. I am a single mother, alpine mountaineer, and cyclist. 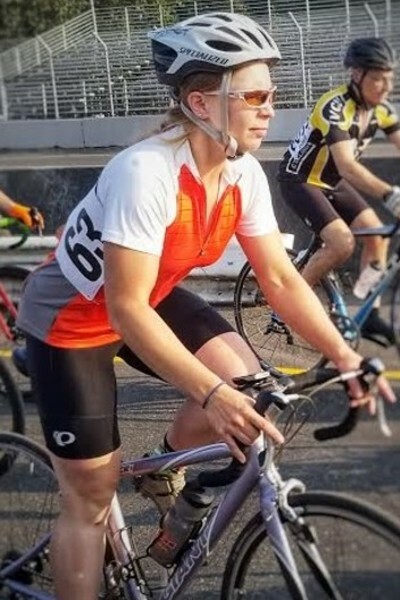 I started incorporating cycling into my routine to stay fit for climbing and started racing as a novice in my mid 30’s. When I am not on a bike or a mountain you can find me out and about with my two pre-teens and energetic Boston Terrier. After years of bike commuting and recreational riding I wanted to further challenge myself on the bike. 2018 marks my first year of racing as a novice in both road and cyclocross. I quickly found myself falling in love with life on two wheels. I want to put my fitness, skills and general cycling know-how to the test by completing a century ride. While my job has me in the office Monday to Friday, in reality I am often mentally “on the clock” during my off hours because of my passion for what I do. Additionally, as a single mother, I have found it challenging to make time for self-care. When I am out on the bike I have no choice but to clear my mind. Cycling has given me the space to return my focus to myself while also benefiting my physical health. I have found strength in my mind and body that I did not know existed. This knowledge has benefited me off the bike as well, making me a more confident, calm and self-aware individual.